Is it spring break where you are? 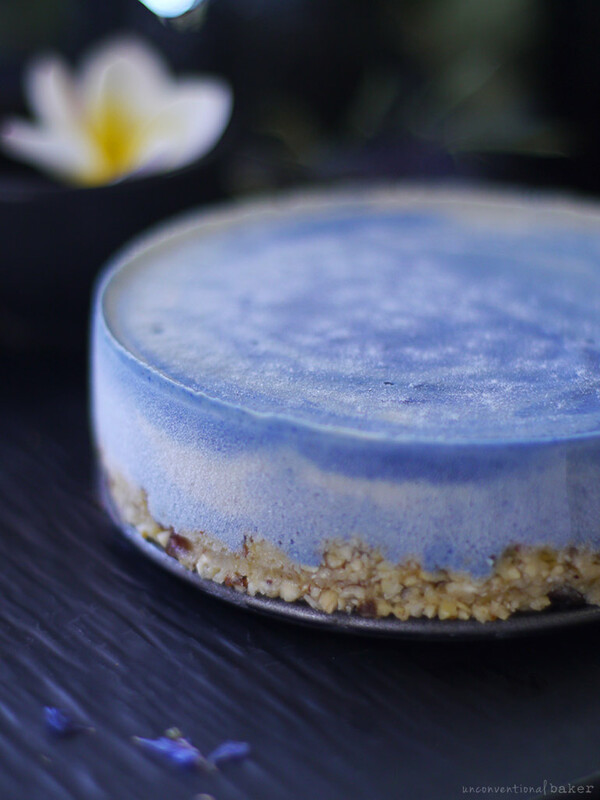 Because I’ve got just the thing for you if it is… Blue surf cake. Also known as Ocean cake, Tidal Wave cake, Cloud cake, Beach cake. Maybe it could even be Galaxy cake…! This is basically your recipe when you’re looking for a fun cake that’s blue-themed and natural (in every sense). Isn’t it incredible how something as simple as a color can change your whole perception of a cake? Colors are one of those things that make me incredibly happy. Gentle hues, enchanting wispy swirls of pretty shades, color-themed desserts. 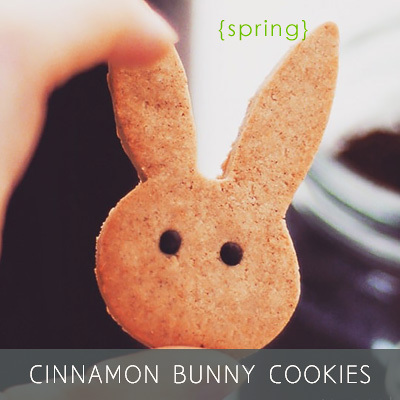 It’s a kind of grown up “playing with food” I wholeheartedly approve of. And sometimes you just need that extra shade to make a particular “theme” happen. It’s wonderful when you have basic ingredients on hand to co-operate with your vision: you know, red berries for pinks and peachy tones, turmeric for yellow, blueberries or blackberries for gorgeous purples, spinach or avocado for greens, etc. (P.S. 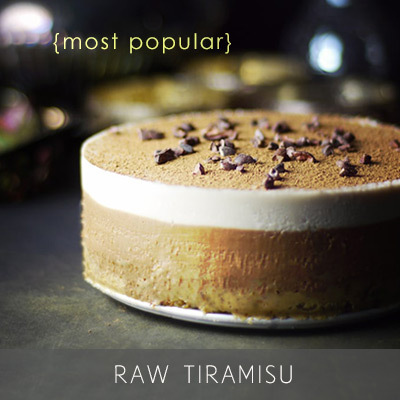 If you need some inspiration / guidance in that department, check out the raw cake natural coloring guide, which you can download from the homepage of this website). But when you need a natural blue… It can certainly be a pickle! 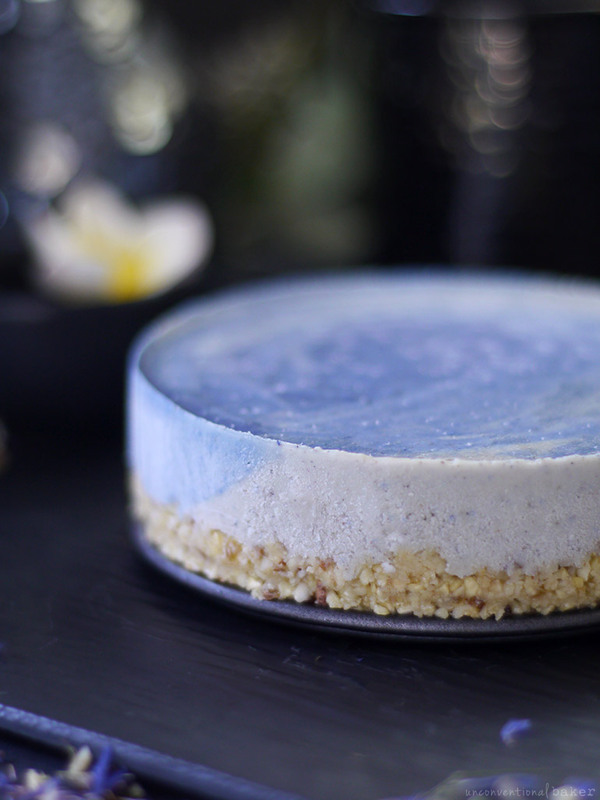 It’s a dilemma I’ve already struggled through when this raw blueberry cashew cheesecake happened. I got a reader request for a blue birthday cake to fit in with a specific party theme. Strapped for natural options in my kitchen I’ve gone through the rounds and tried everything in sight to create a gorgeous blue cheesecake to no avail. Luckily in that circumstance I found a good workaround solution, but the hunt for the perfect blue colorant never left my mind. And so I’ve been on the look out and experimenting with different options since. 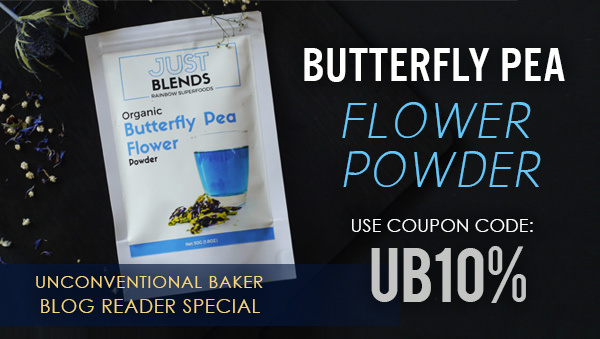 I finally landed on what I think is the perfect solution: blue butterfly pea flower powder. That’s what’s coloring this cake. All natural. All simple. All the blue shades you’ll ever need. And more (since blue powder has some magical chameleon properties I’ll tell you about in a minute). Blueberries, black currant, blackberries, fresh or frozen. Result: so purple! Blue fruit and veg chemistry, involving combining things like purple cabbage juice and baking soda or berries, etc. : works wonderfully for some things, but not for raw cakes. You can read about my experiments with it here. 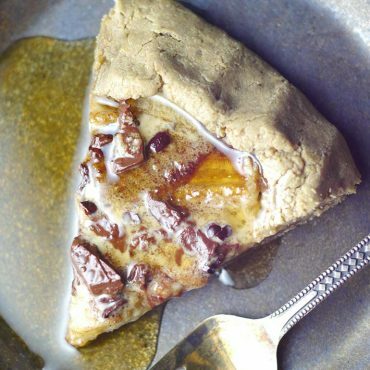 In a nut shell: it worked for me for things like frosting or parfaits, but not raw cheesecake. If you’re curious about the cabbage method though, on my blogging pal Natalie has a great DIY tutorial on it here. Blue food dye. No artificial dyes for me… There are some great natural ones out there, but they tend to be hard to find and costly. If you’re interested, here’s a brand I love. Blue matcha powder. That’s one I haven’t tried yet, but have seen pretty things made with on Instagram and think it’s an interesting option. It seems pretty comparable to me to the butterfly pea tea powder I used here, though the butterfly tea I found to be a lot more affordable. Blue Majik spirulina. I’ll admit I coveted this option above all else. It makes the most gorgeous blues hands down. I also like spirulina and use it regularly for personal purposes and in treats, so switching to a blue-er version would be quite simple. But. BUT. I tried to picture what you’d think of me if I told you you needed to purchase a $65 (or over $100 in some countries) bottle of algae powder so that you can use a sprinkle of it in a cake… Somehow I imagine that wouldn’t have gone over too well ;) I’d still absolutely favor this option, just not at this price point. Loose Leaf butterfly pea tea: when I first heard of blue butterfly pea tea and its magical coloring properties I ordered a bag of loose tea straight away. It’s a common drink in many Asian countries, especially Thailand. It makes beautiful steeped or iced teas. It’s a stunning shade of blue. And if you add a bit of lemon it turns pinks and purples galore. Chameleon tea chemistry right there! So gorgeous for serving as a tea or refreshment for guests. Also really fun for kids experiments — a friend recently did a Harry Potter-themed birthday party for her girl and they made magic color changing “potions” in little vials and this tea is so perfect for stuff like that. In short, it’s awesome and fun. But steeping a whole batch of tea isn’t going to work for cake — you need a much more concentrated blue for something like that. That’s where the powder comes in handy instead! I came across the blue butterfly pea tea powder quite by chance. 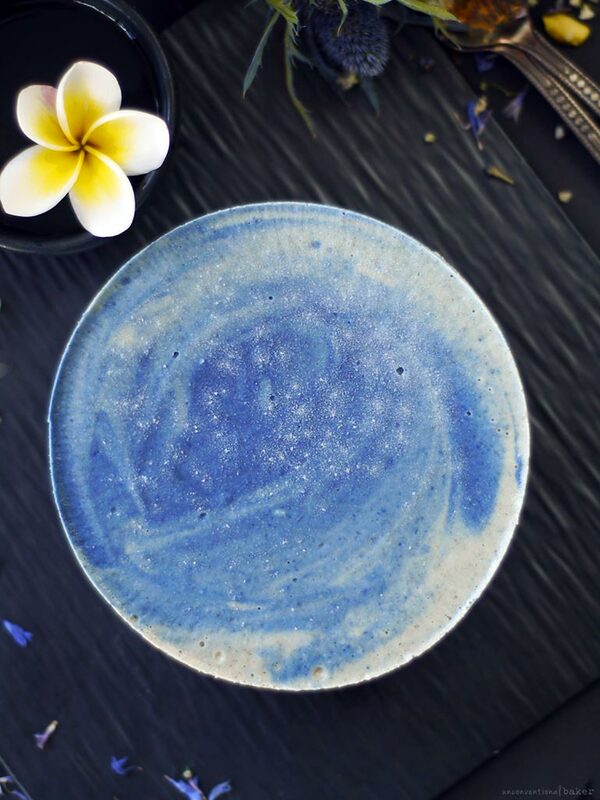 A friend told me about some pink pitaya powder she’s been using, which got me to the Just Blends website where I discovered the blue powder I’ve been looking for all along. It seemed quite affordable, and to be honest at that stage it was between succumbing to the costly Blue Majik siren call or going with this. I decided to order some and see what happens. I was really impressed with the product. I liked that it shipped internationally, was affordable, natural, and well packaged. I also loved that I could order it right along with the pitaya powder (which I adore!). So it was a pleasure to work with from start to finish. I’ve been having fun using it in cakes like this, in ice cream, and even breakfast. I liked it so much I even emailed Just Blends to tell them I thought it was a great product. The oddest thing happened when I got an enthusiastic email back from the owner of Just Blends. Strange coincidence: turns out the lady who owns it is someone I knew from from my Instagram circle and who is a fan of my work and she was really excited to hear from me ?. Strange coincidence the second: a good blogging pal of mine (Anthea from RainbowNourishments.com) happened to be staying at that lady’s house and they were just talking about my blog when I emailed… Small world! Steph, the lady behind Just Blends, even gave me a 10% discount code for my blog readers. If you order from her, use the coupon code “UB10%” to get ten percent off any of your purchases. Last but not least, in all the “blue” excitement, I forgot to tell you about one other feature of this cake: it’s oil-free. Yep, no coconut oil, and still all light and white! Yipee! One tiny last note I’ll share: the cake is lemon-free. Keep in mind the chemistry chameleon note above re: the blue color changes shades when it comes into contact with acids. Also, about the hues — the directions are recreating the cake pictured, but of course feel free to improvise and adjust the colors to your liking. As per usual, this recipe is for a tiny 5″ cake (this is the pan I use). See downloadable cake size guide below if you need help with sizing this cake up or down. Also, if you need any tips to get comfortable with raw cake making, you may find Unconventional Treats handy for that. Oh, and one more final note: because this cake is designed to be very lush and creamy (no coconut oil, remember..), it’ll also get quite melty if not kept frozen. So be sure to serve it frozen, or thaw out for just 5-10 minutes prior to serving. 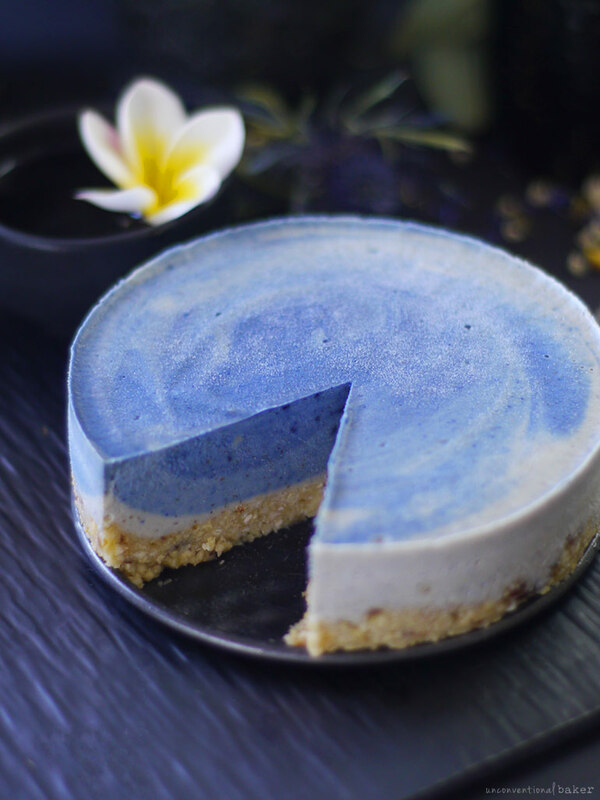 A fun, tasty, blue-themed no-bake cheesecake recipe. Perfect for blue surf, fluffy clouds, or blue galaxies. 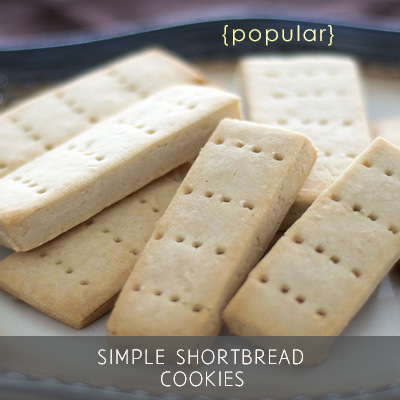 Naturally dairy-free, oil-free, and refined sugar-free. Process all crust ingredients in a food processor. Transfer into a 5″ springform pan and press down into an even flat crust. Freeze while working on next step. Add all filling ingredients, BUT ONLY ¼ tsp blue butterfly tea powder, to a power blender and blend into a smooth creamy consistency. Remove a third of this mixture and pour it into the springform pan over the crust, trying to keep it mostly to one side (let’s say keep it to the right). 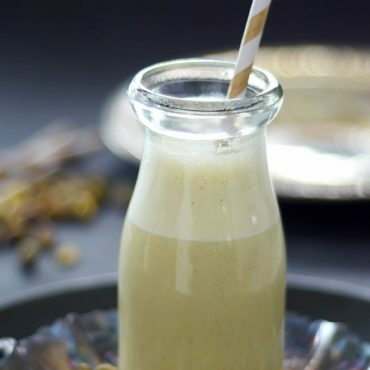 Add in ½ a tsp more blue butterfly tea powder to the remaining mixture in the blender and blend once again to combine. Transfer half this mixture into the springform pan, placing it mostly into the center, or slightly to the left side. Add another ½ tsp blue pea powder to the remaining mixture in the blender and blend to combine. Transfer this mixture into the pan, pouring it mostly to the left. Now use a skewer or a small spoon to lightly swirl the mixtures together. I used a circular motion and went mostly around the edges of the pan to create the sea wave effect. Feel free to improvise — just don’t over-mix or the different layers will merge into one color. Freeze for 6 hours or overnight. Keep frozen until serving time. Slice and enjoy! Keep any leftovers frozen. 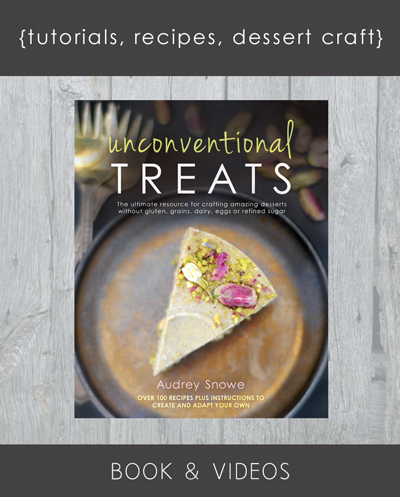 This post contains affiliate links to the following products: natural food dyes, Blue Majik spirulina, whole butterfly pea tea, 5″ cake pan, raw cashews, medjool dates, maple syrup, can of full fat milk, raw ground vanilla bean, salt, power blender, food processor, and the Just Blends powders if you use the coupon code UB10% to get a 10% discount off your purchase. This looks like a seashore in cake form! I cannot begin to describe how beautiful the colors of the top layer are. I have never even heard of butterfly tea, but I bet it has the most lovely flavor and aroma! Hi Cassie. You can’t really taste it in this cake, it’s used more for the coloring. But it’s a lovely looking tea. A brewed version of it is super pretty. Can you do a video on how to mix the mixture together? I tried to mix up the 3 mixture but still couldnt get the correct way to pour the three different color . Could you advice on this part? Hi Vync. A video has just been added as requested! :) Hope that helps. Hi Priscilla. It can definitely be used in baked goods too to create blues. A few things to keep in mind are: the cake base color would need to be white for the color to turn out blue (if the cake is yellowish, the final product could turn out green). Also if blue butterfly pea tea is mixed with lemon juice it turns purple, so you’ll want to make sure it doesn’t come into contact with any. I’m not sure if other acidic agents (like apple cider vinegar) would cause the same reaction — haven’t tried, but you can do a small test in a glass of water by combining blue butterfly pea tea with a few drops of it to see if it turns the water purple. Have you tried it with other flavours than vanilla or do you recommend any? E.g. cardamon, Cinamon, ..? Hi Mira. I haven’t tried this blue cake theme in other flavors — I went with vanilla because somehow it made sense to me with the tropical / sea theme. Also color-wise, I was worried some spices might add a bit of a color that would turn the cake colors a bit murky or “muddy.” But I’ve made many similar raw cakes with cardamom, and cinnamon, rose water and orange blossom water, berries and berry powders, etc. — there’s definitely room to play around and add flavors to your liking. I am wondering whether I can crush dried butterfly pea flowers to make butterfly pea flower powder? Hi Kathy — argh, what a shame. Don’t feel bad — I’ve done the same thing in the past and still have a whole bag of butterfly pea flower tea hanging around ? I’ve thought of the same when it happened to me, but upon examining the flowers I determined that they were not dried enough to be ground properly. If yours are super dry though (such that you can easily crush them with your fingers into dry bits), I would totally give that a go. Hmmm I did have a go at one of the flowers earlier and I may just have to go with that as I need to make the cake tomorrow for Friday!! Yes I made my daughter and I a cup of blue tea yesterday- she thought it was pretty but didn’t really taste of anything – such insight from an almost 3 year old!! 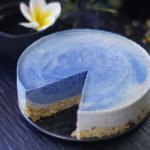 Would I be able to use drops of the tea as colouring for blue surf cake? Drops of tea would be too diluted though, so I don’t think they won’t make a color difference, unfortunately. Does the theme have to be blue? If so, maybe this blueberry cake would work better? 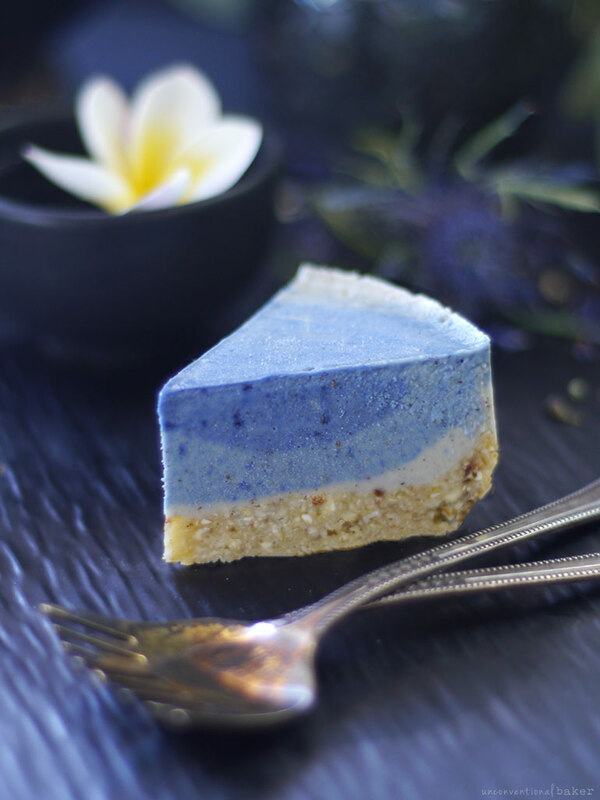 If blue isn’t a must, there’s a similar cake to this surf one that I made with pink pitaya powder, but you can use any pink berry powder you like instead and others can be more commonly accessible (even at a pharmacy or supplements section of grocery stores, as they often sell raspberry or cranberry powder capsules, for example). This beetroot cake is another example of that. You can also go for just regular pink cake using fresh strawberries. 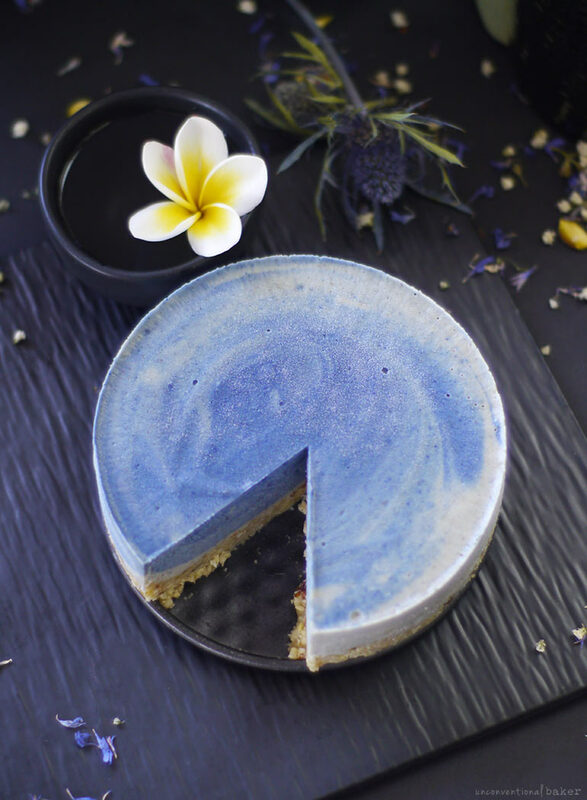 One last alternative I can think of is purple cake using maqui powder, like in this lilac cake (you can replace lilac with just any nut milk instead), or this maqui tahini cheesecake. And there’s always the beach cheesecake if you want to stick to an ocean theme. It looks like the day has been saved! I dryer some of the flowers further in the oven and then crushed the petals down with a pestle and mortar. Check my Instagram profile @kangelone to find out how my blue surf cake turns out on Friday!! Oh, phew! ? That’s good to hear! :) I’ll definitely check it out. I’m glad dehydrating the flowers more did the trick. What does the filling taste like at the end? Like a vanilla ice cream cake. HI my daughter wants me to make this cake for my grandson’s 2nd birthday and she does not want me to use coconut cream, she saw another cake recipe somewhere that uses Nutiva Coconut Manna I am not a baker I just make healthy food for my grandson so have no idea what that is but wondering if we can replace the coconut cream with the coconut manna? Hi Noemi, I’m so sorry for not being able to reply sooner. I’ve been sick the last few weeks, so just catching up on comments now. The manna will work, but will make the cake a lot firmer, so I would add more liquid (non-dairy) milk to offset that. Coconut cream is very soft, whereas coconut manna has a firmer consistency. Hey.. an FYI I just tried downloading the raw cake multiplication helper but it doesn’t appear to be working for me, recipes are amazing, thank you for your blog ! looking fwd to trying them x Oh and now I see an email has come into my inbox, I assumed it would download immediately ! Thanks I am confused though by the ingredient quantity being x 8 if the size of the pan is changing from 4″ to 9”, seems heaps more ingredients rather than just pretty much doubling which I would expect? I know it can seem confusing, and the natural inclination is to double, etc. but the thing is that these pan sizes are measured not by inches, but rather by volume (i.e. how many cups can fit into the pan). Increasing the pan size by 1″, 2″, or 3″ changes the volume capacity of the pan quite significantly (especially for the larger sizes where the sides of the pan go up taller as well). The guide I created is taking into account average standard volumes of 4″ pans, 5″ pans, 6″ pans, etc. and makes change recommendations based on that. Hi Hanne — thank you so much for your lovely comment :) Enjoy all those dates!